SEATTLE – April 10, 2015 – Rock ‘n’ Roll Seattle Marathon & ½ Marathon, a signature Seafair Event announced a new Rock ‘n’ Roll 8K distance taking place on Saturday, June 13. The race will start and finish with the marathon and half marathon at Seattle Center. Runners who participate in the 8K distance will receive a finisher medal, t-shirt and access to the post-race beer garden and finish line festival concert. 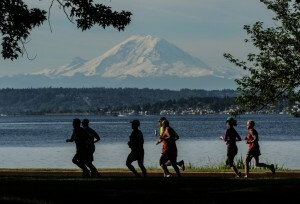 Rock ‘n’ Roll Seattle will take runners on a tour through the scenic sights of Seattle. The 8K course starts and finishes under the iconic Space Needle and offers breathtaking views of the Cascades, Mount Rainier, Downtown Seattle and CenturyLink Field. Local bands will play through the streets of Seattle, along with spectators and cheerleaders lining the route to motivate runners to the finish line. Upon finishing at Seattle Center, participants are invited to relax and celebrate with family and friends at the finish line festival. Race weekend kicks off with a free Health & Fitness Expo, where runners can find numerous vendors, interactive clinics with running experts, elite athletes, and much more. The Expo takes place at CenturyLink Field Event Center on Thursday, June 11 from 12 p.m. to 7 p.m. and Friday, June 12 from 10 a.m. to 7 p.m. The Expo is free and open to the public. Information and registration is available online at runrocknroll.com/seattle . A signature Seafair event, Rock ‘n’ Roll Seattle Marathon & ½ Marathon will run through scenic Seattle on Saturday, June 13, 2015. The race annually draws more than 20,000 entrants, with live bands and cheerleaders interspersed along the course. A two-day Health & Fitness Expo at CenturyLink Field Event Center will kick off race weekend on Thursday, June 11 and Friday, June 12. The expo will have numerous fitness retailers and interactive exhibits. The musical block party concludes with a post-race concert, which is free and open to the community. For more information about Rock ‘n’ Roll Seattle, visit RunRocknRoll.com or follow @RunRocknRoll on Twitter.